Andrea del Verrocchio (originally Andrea di Cione), Florentine sculptor and painter, who is ranked second only to Donatello among the Italian sculptors of the early Renaissance. His equestrian statue of Bartolomeo Colleoni, erected in Venice in 1496, is particularly important. Little accurate biographical information is known about Verrocchio. He was the son of Michele di Francesco Cioni, a maker of bricks and tiles who later became a tax collector. Financial security always seemed to be a family problem. 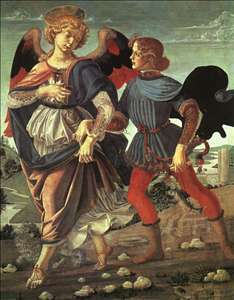 Verrocchio had to support several of his brothers and sisters. Never marrying, he later provided for the education and dowries of the daughters of his younger brother Tommaso. Initially he was trained as a goldsmith. His master has traditionally been recorded as a supposed goldsmith, Giuliano Verrocchi, whose last name Andrea apparently took as his own. Another questionable biographical tradition is that of his apprenticeship under Donatello, the greatest Italian sculptor of the early Renaissance. Since the stylistic affinity of Verrocchio s early sculpture is with the work of Antonio Rossellino rather than Donatello, this liaison seems doubtful. His first studies in painting date possibly from the mid-1460s. He is said to have been a pupil of the Florentine artist Alesso Baldovinetti. But it is assumed that he and Sandro Botticelli worked together under the early Renaissance master Fra Filippo Lippi at Prato, a city near Florence, where Lippi had been commissioned to execute a series of murals for the cathedral. Verrocchio s most important works were executed in the last two decades of his life. His rise to artistic prominence, which he owed chiefly to encouragement by Piero de Medici and his son Lorenzo, the leading art patrons of Florence, evidently began only after the death, in 1466, of Donatello, who had been the Medici favourite. Besides the paintings and sculptures Verrocchio produced for the Medici, he designed costumes and decorative armour for their festivals, tournaments, and solemn receptions. Made curator of the collection of antiquities in the Medici palace, he restored many pieces of ancient Roman sculpture, especially portrait busts. It appears that Verrocchio produced few works for patrons outside of Florence. Though he is said to have worked in Rome for Pope Sixtus IV among others, there is no documentary trace that he ever left the area around Florence until the early 1480s, when he moved to Venice, where he died within a few years. Even while he was in Venice his Florentine workshop was maintained and directed by his favourite student, Lorenzo di Credi who was also the administrator and principal heir of Verrocchio s estate. Verrocchio s reputation was widespread in the second half of the 15th century and many well-known artists of the Italian Renaissance studied painting and sculpture at his Florentine studio. 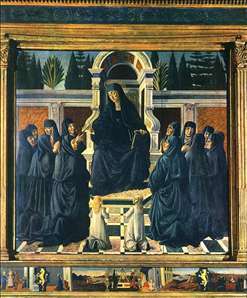 The most important of his students were Leonardo da Vinci and Perugino, the latter Raphael s teacher. 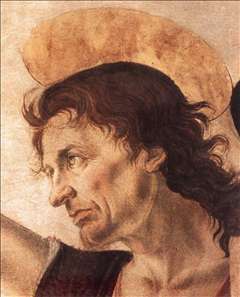 The mural painter Domenico Ghirlandajo, Michelangelo s master, was temporarily in close contact with Verrocchio. 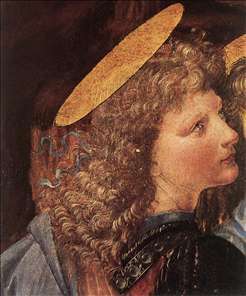 Sandro Botticelli, the major Florentine painter of the late 15th century, and Francesco di Giorgio, the important Sienese artist, clearly oriented themselves toward Verrocchio s art in certain phases of their development, as did the prominent Florentine sculptors Benedetto da Maiano and Andrea Sansovino. The only surviving painting that according to documentary proof should be by Verrocchio, an altarpiece of the Madonna and Child with Saints in the Donato de Medici Chapel of the cathedral at Pistoia, was not completed by the master himself. Largely executed by his pupil Lorenzo di Credi, its handling is inconsistent with that of the Baptism of Christ (c. 1474/75; Uffizi, Florence), which has been attributed to Verrocchio ever since it was first mentioned in 1550 by the Renaissance biographer Giorgio Vasari (1511-74) in his Vite de pi eccellenti pittori, scultori, ed architettori italiani . . . (Lives of the Most Eminent Italian Painters, Sculptors, and Architects . . . ). 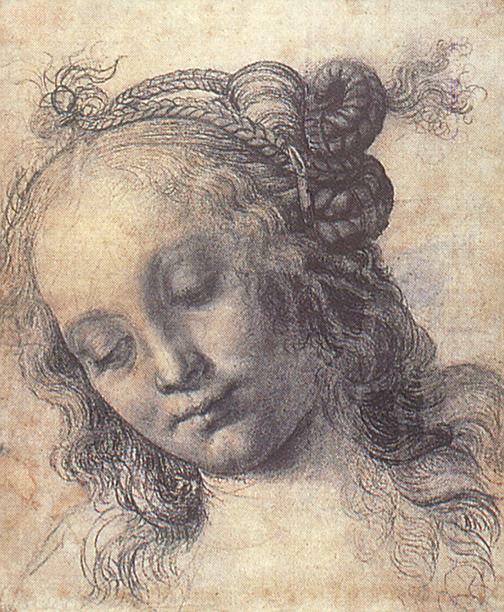 One of the two angels and part of the distant landscape in the Baptism, however, were certainly painted by his apprentice, the young Leonardo da Vinci. 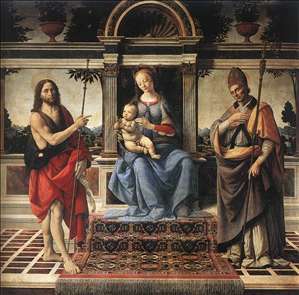 Other paintings ascribed to Verrocchio are the Madonna in the Staatliche Museen, Berlin, the Tobias and the Angel in the National Gallery in London, and the altarpiece in Argiano, with Christ on the Cross between St Jerome and St Anthony. After the mid-1470s Verrocchio dedicated himself principally to sculpture, in which he manifested strong personal convictions and an inventive ability. The sculptural works either recorded to be by Verrocchio or actually extant are few in number. According to his brother Tommaso, Verrocchio was responsible for an inlaid slab (1467) in the Florentine church of S. Lorenzo recording the burial place of Cosimo de Medici, who died in 1464. In 1468 Verrocchio is known to have executed a bronze candlestick (Rijksmuseum, Amsterdam) for the Palazzo della Signoria in Florence. This work was followed by his first major commission, the tomb of Piero and Giovanni de Medici in the Old Sacristy of S. Lorenzo. Completed in 1472, this sarcophagus, set in an archway, is impressive for its originality of composition and its inspired use of coloured marble and porphyry in conjunction with rich bronze ornamentation. Verrocchio s earliest surviving example of figurative sculpture is a small bronze statue of David (Bargello, Florence), which is generally dated before 1476. A second bronze figure, the Putto with Dolphin, is important in the development of freestanding Renaissance sculpture for its spiral design, which represents a successful effort to evolve a pose in which all views are of equal significance. It was originally commissioned for a fountain in the Medici villa in Careggi, near Florence. The putto, sometimes called a cupid, is precisely balanced in the projection of its limbs and probably was placed initially on a fountain so that it could be turned by the pressure of streams or jets of water. In the mid-16th century it was reinstalled on top of a fountain designed for the courtyard of the Palazzo Vecchio in Florence (the original is now kept in the Palazzo Vecchio museum; the present fountain figure is a copy). Verrocchio s reputation as one of the great relief sculptors of the 15th century was clearly established with his cenotaph, or memorial, in the cathedral at Pistoia, to a Tuscan ecclesiastical dignitary, Cardinal Niccol Forteguerri. Ordered in 1476, the cenotaph was still unfinished when Verrocchio died, and its completion was entrusted first to Lorenzo di Credi, then to Lorenzetti, and finally to a minor Italian Baroque sculptor. Though its effect has been altered by changes and additions foreign to Verrocchio s original design, the Forteguerri cenotaph contains some of the artist s most important relief sculpture. Its scenographic arrangement of the figures into a dramatically unified composition anticipates the theatrical effect of the dynamically composed wall reliefs executed by Baroque sculptors of the 17th century. 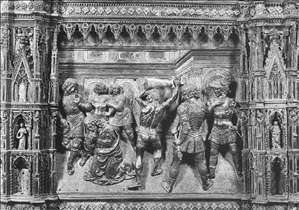 Another relief dates from 1478/79, when it was decided to extend the silver altar in the baptistery of the cathedral of Florence, and one of the four supplementary scenes was allotted to Verrocchio. 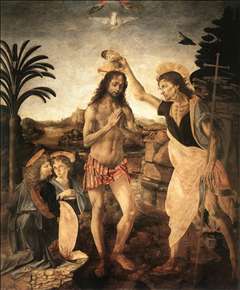 Depicting the Beheading of St John the Baptist (Museo dell Opera del Duomo, Florence), this work was delivered in 1480. Dating from about 1477/78 is a terra-cotta relief of the Madonna (Bargello, Florence) coming from the Florentine hospital of Sta. Maria Nuova. In the late 1470s Verrocchio produced two portrait sculptures. A penetrating realism distinguishes his terra-cotta bust of Giuliano de Medici (in the National Gallery of Art, Washington) from the idealization of the individual that characterizes his marble bust known as Lady with Primroses (Bargello, Florence). The latter work created a new type of Renaissance bust, in which the arms of the sitter are included in the manner of ancient Roman models. This compositional device allows the hands, as well as the face, to express the character and mood of the sitter. Perhaps the most important work Verrocchio executed in Florence was a bronze group of Christ and St. Thomas commissioned for a niche in the east exterior wall of the Or San Michele in Florence. Executed between 1467 and 1483, the work is remarkable for its technical perfection, highly intellectual sense of compositional design, and understanding of the subtle emotional nature of the subject. 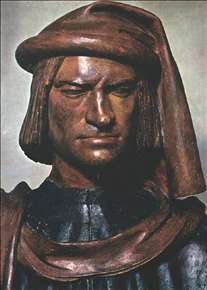 In 1483 Verrocchio was commissioned by the Venetian government to undertake a second major work in bronze, a commemorative statue of Bartolomeo Colleoni, a condottiere, or professional soldier, who had been employed by the Venetian republic. At Verrocchio s death the model was not yet cast, and the work of casting and chasing, or polishing, was entrusted to the Venetian sculptor Alessandro Leopardi. It was erected in 1496 in the Piazza SS. Giovanni e Paolo in Venice. The movement of the horse and commanding forward gaze of Colleoni gives the impression that the warrior is riding into battle at the head of his troops, who press behind. This innovative scenographic conception was influential in the development of the equestrian figures executed from the Baroque period of the 17th century to those produced in the 19th century by sculptors of the Romantic style. Besides Donatello s monument to the condottiere Gattamelata (c. 1447-53) at Padua, Verrocchio s Colleoni monument is aesthetically the most important equestrian statue of the Renaissance. Contrived with great technical assurance and modelled with power and sensitivity, it forms a fitting climax to Verrocchio s sculptural career. See more details about "Saint Monica"
See more details about "Lorenzo de Medici"
See more details about "The Baptism of Christ (detail by Leonardo da Vinci)"
See more details about "Head of a Girl (study)"
See more details about "Madonna with Sts John the Baptist and Donatus"
See more details about "Beheading of St John the Baptist (detail of the altar)"
See more details about "Christ and Doubting Thomas"